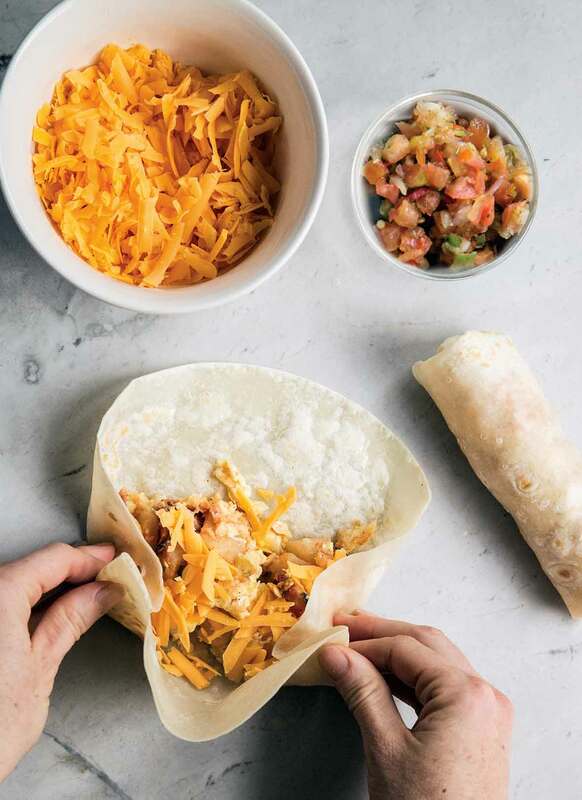 These breakfast burritos–eggs, cheese, potatoes, bacon, and salsa wrapped in flour tortilla–are fast, healthy, able to feed a crowd, easy to stash in the freezer, and quick to reheat. Take them on the go, to work or to school, weekday mornings. 1. Place the diced potatoes in a large pot of water and then bring them to a boil. Cook until tender but not falling apart, about 4 minutes from the time the water comes to a boil. Drain the potatoes. 2. Meanwhile, in a large skillet over medium-high heat, fry the bacon until crisp. Transfer the cooked bacon to a paper towel-lined plate. Pour off half the bacon drippings from the skillet and reserve for another use. 3. Return the skillet with the bacon drippings to medium-high heat. Add the potatoes to the skillet and sprinkle with 1/2 teaspoon (3 grams) salt. Cook the potatoes, stirring only occasionally, for about 10 minutes, or until the edges start to brown and crisp. 4. While the potatoes are frying, whisk the eggs. Season with salt and pepper if desired. 5. When the potatoes are done, transfer them to a large bowl. Add a little more oil to the skillet, if necessary, and then pour in the whisked eggs. Place over medium heat and scramble the eggs to the desired doneness. Gently dump the scrambled eggs into the bowl containing the potatoes. Add the salsa or enchilada sauce and crumbled bacon and gently toss to combine. I like this breakfast burritos recipe. By varying the salsa, you can have many different flavors. You could also conceivably vary the potatoes (sweet potatoes), vary the bacon (turkey or vegetarian), and vary the type of cheese. This was fun and easy. I used one pan to cook everything that goes into these breakfast burritos and the directions made everything very easy. It was so simple that the second time I made the burritos, I didn't have to look at the recipe at all. Great taste. My guests said they would add more enchilada sauce or salsa next time but these are fine just as it is. And they're just as good reheated! I doubled the amount of potatoes and cooked them on the stove for 15 minutes. I saved the other half and made a second batch of burritos a few days later. They turned out great. These breakfast burritos were excellent. I used salsa and I fried the bacon while the potatoes boiled to cut down on the total time. I made 9 burritos and froze 5 for later use. I love a good breakfast burrito and really enjoyed the tips given in this recipe. When it comes to breakfast potatoes, we usually cube and pan fry a cold leftover baked potato, or just cube and soak raw potato in water and then drain it before cooking it in a skillet. I absolutely loved the method of the pre boil because it helps remove the starch from the potatoes, similar to a soaking of raw cubed potatoes, and it really does speed up the cooking time. Win! One note: I love adding Montreal Steak seasoning to my breakfast potatoes while cooking, a trick I learned from one of my favorite breakfast restaurants. I happened to have some green onions on hand and when I do I usually thinly slice them and add them to the potatoes during the last 5 minutes of cooking. For the bacon, I baked it on a parchment paper-lined sheet pan but still used some of the bacon grease to cook the potatoes. This worked well for me as I really dislike cooking bacon in a skillet. The assembly of the burritos was easy and we really enjoyed our breakfast this morning. I like the idea of freezing extra breakfast burritos, but we didn't make enough to freeze, we only made enough for one breakfast burrito per family member. Sour cream and sliced avocado were some of the extras we added. And a sprinkle of Crystal Brand Hot Sauce in addition to salsa. YUM! Breakfast Burritos Recipe © 2016 Becky Rosenthal. Photo © 2016 Becky Rosenthal. All rights reserved. All recipes and photos used with permission of the publisher. We use southern style frozen hash browns for these. It cuts out the chopping and boiling steps. Left over cheesy potatoes also work great. If you are assembling to freeze, just add them cold. If you want to eat them right away, heat the potatoes in the microwave. Either of these short cuts make a good recipe even easier. I love the frozen hash browns idea, Linda. My dad used to take them, canned corned beef, and onions on camping/hunting trips. He’d chop the onions, break up the corned beef and hash browns with a fork, and then cook them all together over a campfire. Whether it was topped with a fried egg or not, I still have delicious memories. My mom wouldn’t have frozen hash browns in the house, but she gobbled Dad’s camp-style corned beef hash right along with the rest of us. I’m definitely giving this idea a try. There are so many options to play with. Thanks! Great tip I learned from Smitten Kitchen, “arrange potatoes in large microwave-safe bowl, top with 1 tablespoon butter, and cover tightly with plastic wrap. Microwave on high until edges of potatoes begin to soften, 5 to 7 minutes, shaking bowl (without removing plastic) to redistribute potatoes halfway through cooking.” Much quicker than boiling them and it works great. It’s how I always start my home fries now. Hey, swell, Mom24! Many thanks! What a great idea. I gave these out instead of Christmas cookies this year since there are always plenty of cookies. Becky, you have my attention. You gave these out instead of cookies? For breakfast? As holiday gifts? This update is for the burrito freezing technique which works amazingly well, even for non breakfast burritos! I immediately thought of this recipe when I needed to assemble and freeze some pinto bean burritos. I made a pot of pinto beans but we decided at the last minute to go out of town and I did not want to throw out the beans I had just cooked. I wrapped the beans in the tortillas to form burritos, placed them on a sheet pan in a single layer in the freezer, and the next morning wrapped each perfectly solidified burrito in plastic wrap and in the freezer bag they went. I absolutely love this tip! My husband took a burrito to office and loved it! Thank you, Dawn! 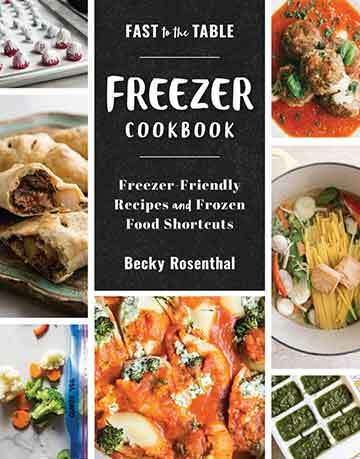 We greatly appreciate the freezer trick thumbs up! Incredibly helpful!